Of all the seasons, fall and winter are the biggest hassle for homeowners. There is an enormous amount of prep work that needs to be done to ensure a smooth transition of seasons. Most families will spend their time prepping their yard or the exterior of their home. However, any family with a patio will want to make sure that they prepare their patio furniture for fall and winter. There are a number of things that homeowners can do to ensure the safety of their patio furniture. Optimally, you should be storing all of your metal, plastic or wooden patio furniture. These materials are prone to the wear and tear that comes with the fall and winter seasons. The abundance of rain and snow will rot away your wood furniture and will rust your metal furniture. As for plastic furniture, the excessive cold may cause cracks that can lead to further damage down the road. If possible, store the furniture in a garage, basement, or storage unit. If you do not have access to any of these, it may be best to invest in a weather resistant storage bench. This will ensure that the furniture will stay warm and dry. As with anything else, it is important to properly maintain your patio furniture. This includes giving everything a thorough cleaning before putting them away for the fall and winter. Cleaning the furniture will ensure that is free of dirt and debris, which could potentially scratch or damage the furniture or become difficult to remove by the time spring comes around. The cleaning process can differ for each piece of furniture. Anything that is metal, glass or plastic can be wiped down with water and soap. Wicker furniture should be dusted and wiped down with a dry cloth. It is also not a bad idea to wash any pillows or cushions, as they can become grimey after prolonged periods outside. 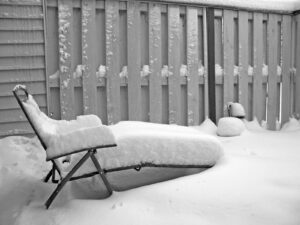 Although it can take some time, it is extremely important to properly prepare your patio furniture for the fall and winter months. It is necessary to have a storage area for the furniture and it is important to give everything a thorough clean, as both of these things prolong the life of the furniture. Plus, who wants to spend the first day of spring cleaning off patio furniture? For more information on preparing your patio for fall and winter, feel free to contact Palm Casual.